Hardware virtualization refers to the creation of a number of self-contained virtual servers that are resident on the physical server, or host machine. This allows multiple applications to be run on the same machine while providing security and fault isolation. Typically an administrator decides how much of each resource — CPU, memory, net- working — to allocate to the virtual machine (VM), while assigning priorities to different classes of users. The virtual infrastructure dynamically enforces these policies to ensure that each VM gets its fair share of resources. The combination of virtualization and cloud computing provides value to both the end users and IT providers in HPC and enterprise environments. And, once created, these private clouds can be burst to a hybrid cloud to create seamless and secure extensions of the organization’s on-premise infrastructure. Performance is the key. Read this informative guide to learn more. Will Containerization Eat Configuration Management? In this video, Matt Herreras and Josh Simons discuss recent developments in virtualization technologies for HPC. Please pay attention, folks. This stuff is going to change how we, as a community, get supercomputing done and it is happening now. The Johns Hopkins University Applied Physics Laboratory migrated independent grids into a fully virtualized environment that reduced idle computing cycles while a providing a big jump in throughput when pushing millions of calculations through the system. 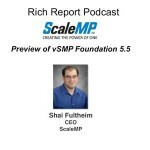 In this slidecast, Shai Fultheim from ScaleMP provides an update on the company’s recent announcements and previews vSMP 5.5 Foundation software. With the rise of in-memory analytics, the company is seeing rapid deployment growth for its server aggregation software. In this slidecast, Matt Herreras and Josh Simons from VMware describe how Hybrid Cloud powered by virtualization offers increased scientific agility for HPC workloads. Make no mistake; virtualization is coming to HPC in a Big Way, and everyone will benefit.